Everything is going mobile. The amount of work that we can now accomplish from our mobile devices is pretty astonishing. In fact, we are slowly but surely making the traditional computer (and even laptop) obsolete. Mobility allows businesses to create a flexible work environment where employees can be productive anywhere, anytime. This means that they are able to save money on office costs, and enlist remote workers as employees. In short, the idea of the traditional office setting is fading away. With mobility becoming such a huge piece of businesses, it is important to make sure that you have an IT support company that is going to support those mobile devices. 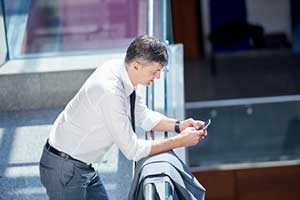 Mobile devices get viruses and need maintenance just like any other piece of computer equipment. Generally speaking, when someone is having a problem with the phone or tablet, they will most likely call up the store where they purchased it. But, as these mobile devices get used for more business-related purposes, they are going to need to be treated the same way you would treat any other device for your business, and that means calling up your IT support professionals when you encounter a problem. There are so many different types of mobile devices out there these days. Network Depot does support mobile devices for clients, but we concentrate on three of the major players: Apple, Android, and Blackberry. Together, Apple and Android operating systems make up roughly 90% of the mobile device market, so we tend to focus mainly on them. It is rare that we have a client that does not have one of these two types of phones or tablets. We also still provide Blackberry and Blackberry Server support, because while Blackberry is fading to the background, they were once a major player in the smartphone business world, and we have several clients who still use them. Do You Charge Extra to Support Mobile Devices? Mobile device support is actually covered under our Complete Service Plan. If you aren’t signing up for a Complete plan, you would be using our pay-by-the-hour support, but if you sign up for the flat-rate fee service, which is the Complete plan, mobile device support is covered. It is important that any IT support company these days has a plan in place that includes coverage of mobile devices. The truth is, as the technology keeps progressing and moving forward, especially at the same rapid pace it has been lately, the way we use technology in business is going to continue to change and move forward as well. If your technology is outdated, or your IT services company can’t support the new technology, it’s going to slow down the progress and continued success of your business. So when you’re choosing an IT company to support your organization, make sure they are able to provide services for all devices that your company uses, and will use in the future.